Soon, very soon, Apple will be releasing their latest mobile device, the iPad. It basically looks like a iPhone-ized version of the screen of the old 12" MacBook. It's the start of a sleek new line that will in time support additional features such as a camera and live video conferencing (I'm hoping). What excites me about the iPad is its screen resolution of 1024 x 768 pixels, which should sound familiar to most of you. It's the magic 4:3 ratio of the 90s that most programers and designers are familiar with using as the lowest common denominator for their design. But unlike the CRTs of yesteryear, the iPad has 132 ppi - almost twice the number of pixels packed into each inch making for a beautifully sharp image. The iPhone is incredibly useful even at a resolution of 480 x 320 thanks to Apple's guidelines and Cocoa Touch that encourage apps to build standard infinite drill-down menus; a master-detail-detail-detail... view. But the iPhone is constrained by its size - an issue that does not plague the upcoming iPad. This will allow a return to old school size application where there is more information and context presented for us to consume and interact with. Game developers will finally be able to get their level maps on the screen and not have to resort to "pinch and spread" trickery for zooming to see the map. For business app developers (or almost any software developer) there is 65% - 75% of the screen real estate of a common high end laptop or desktop. But when will I be in an environment where it makes practical sense to have an iPad over a notebook computer? This is a valid question indeed and one that I've heard numerous times. The iPad is not here to replace the notebook computer, nor could it - yet. Rather it's here to augment it by filling in a gap that netbooks have not succeeded in doing for most users. Over the past years we have seen desktop computers give way to laptop/notebook computers for most day to day activities; and this will probably not change for a while. We have also seen the evolution from server farms to virtualized instances running on a single server to cloud computing. At this point the computer is just a screen connecting to a hosted web service. A wireless mobile monitor that weighs about a pound and a half. An iPhone is not large enough to expedite a change in this evolution, but the iPad is. Already I am hearing about and talking with people of the future of computing, the evolution of the interface and beginning of convergence. It's all fantastical talk and nothing is real until is available for us to use, but it is coming. Where developers were sacrificing usability quality due to an itsy-bitsy space they can now step up and design basically for the desktop - and if they set up their project and build systems properly they can end up there as well. No longer tied to a small window of opportunity, the future of mobile computing will be big and the smart developers will seize this opportunity for their own. For not only is the iPad a bigger space to work with, but it's also less crowded by apps and other developers. I wonder how many of you developers are thinking of changing your focus from iPhone to iPad - with an iPhone story as well? We know that we are and we are thrilled to be a part of this exciting new time. What are your thoughts? We'd like to hear what you have to say on this subject. Are you a consumer purchasing an iPad and why? Are you a developer making the change to the iPad because it's less competitive now? 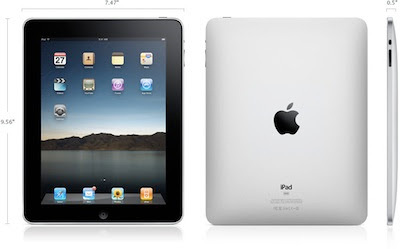 Are you a marketing director for a software product who is thinking about porting to the iPad? Do you think that this a bunch of hype and the iPad will die a slow tortured death like the Apple TV? Whoever you are share your thoughts with the world!